And they are not exactly slimming or particularly healthy. I feel I am one of those cartoon characters from the seventies where the little devil and angel are off of my shoulder, both egging me on to pick them. Well, I chose the dark side my friends. I am choosing to share these recipes with you and I will forever be responsible for that. I accept the fate of my actions, and I have decided that being a little bit devilish is something I just will have to live with. My obsession with the jam and biscuits started with my dad. He was shocked and horrified when I had told him about our ensuing restaurant reservations for our weekend vacation. We weren’t going to Solace?! No, no, that wouldn’t do at all and he proceeded to explain that I couldn’t live without trying their famous tomato jam with cheddar chive biscuits. I promptly changed my reservations to include this local, quirky little restaurant with chicken wire and naked plywood on the walls. Very, very good move. My dad is brilliant! Of course, in his defense, he has been trying to tell me this for years…actually four decades. 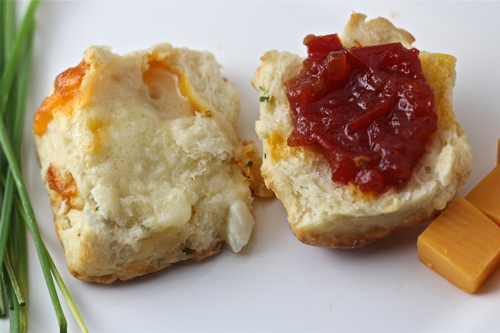 These biscuits melted in my mouth with the perfect tang of the sharp local cheddar and the sweet and spicy-ness of the house made tomato jam (did I mention they also served them with orange infused butter?). Holy he!!. Nothing else compared all weekend, and we ate extremely well at some of our favorite places. I woke up the next morning utterly focused on one thing…replicating the jam and biscuits. I shopped for giant, perfectly ripe tomatoes, surfed the internet until my palate agreed with two versions of these delicacies and when home, went right to work. P-E-R-F-E-C-T-I-O-N. That’s all there is to say. Both recipes from Food in Jars and Sweet Life (from Joy the Baker’s cookbook) were exactly what I was searching for. All hail food bloggers! I brought the biscuits and jam to our Sunday Dinner at my parents’ house and served them to eleven very grateful people. We happily slathered the tomato jam onto toasted filet mignon and havarti sandwiches. That’s what I’m talkin’ about and you know what?! My dad claimed that my jam and biscuits were every bit as good as Solace’s…perhaps better. WHAT?!!! Did I hear that right?! Mission accomplished. So be forewarned, these biscuits and tomato jam are completely addictive but utterly divine so if you choose to accept this mission, please do so at your own risk. Then you can just love me. I’d really rather that. To make the tomato jam: Finely chop the tomatoes. No need to peel or seed. YES, you can thank Marisa of Food in Jars for that wonderful, glorious bit of advice. Put them in a large, Non-reactive pot. Add the rest of the ingredients and bring to a boil. Turn down to simmer and cook, stirring occasionally, for 1 1/2 – 2 hours or until the mixture forms a jam-like consistency. This will last a week in the fridge in typical storage. If you want proper storage and canning instructions, please see Food in Jars. Marisa is immensely knowledgeable and has excellent instructions for canning/jarring and has a great book out too. Makes 11 biscuits, honestly I could not get a dozen out of this recipe no matter how hard I tried. To make the biscuits: Preheat your oven to 400 degrees Fahrenheit and line a baking sheet with parchment paper or a Silpat mat. In a large mixing bowl, whisk together flour through 3/4 teaspoon salt. Cut your stick of butter into small cubes and mix the cubes into the flour mixture with your hands. It’s simply the best way to incorporate butter into biscuits. You want to stop crumbling the mixture when the butter crumbles are about the size of a pea. 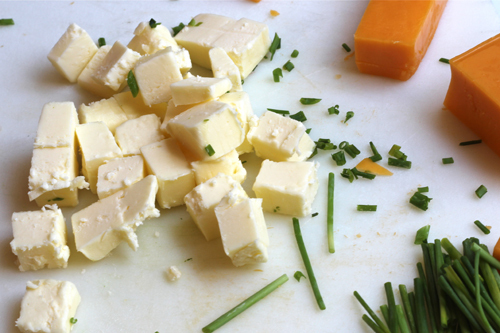 Chop your Cheddar into small cubes. Chop your chives into a fine dice. In a large liquid measuring cup or small bowl, beat together buttermilk and eggs. Add the cheddar chives to the dry ingredients and stir. 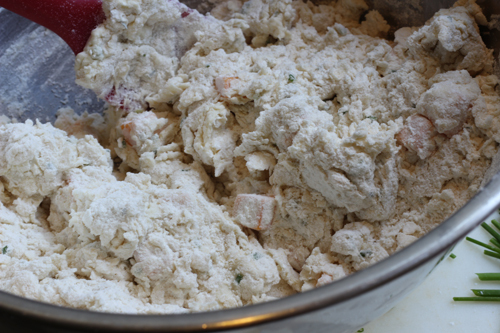 Form a well in the dry ingredients and add half of the buttermilk mixture and stir together. Repeat with the rest of the liquid ingredients and stir just until it comes together and scrape the sides of the bowl. Turn dough onto a lightly floured surface and knead for five minutes (recipe calls for 8 minutes but I simply don’t have that kind of patience). Form the dough into a 1.5 inch thick semi-square by pressing with your hands. 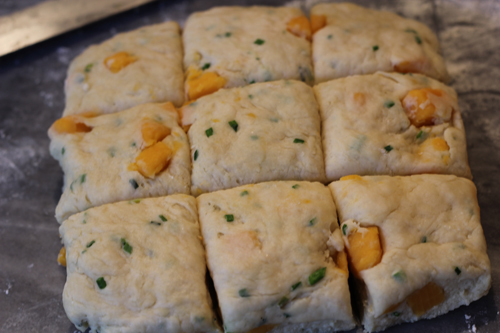 Trim the sides with a pairing knife until you have a pretty good square and then cut into 9 biscuits. See above photo in post for example. Use the tidbits of dough left over to make two more biscuits. Place the biscuits on the prepared baking sheet and brush with the reserved buttermilk (2 T. approx.). Sprinkle each biscuit with a pinch of coarse sea salt. Bake for 12-15 minutes. Please serve them warm. That is truly how they are supposed to be eaten. They are much better the first day but can be stored in an air-tight container for one more day and reheated. These look and sound amazing, Geni. I love the flavors in both. Secondly, these look delish and well done for matching restaurant quality. Hand on heart I tell you that in Australia butter in canary yellow!! Yay, something with tomatoes I haven’t tried. This whole combo is AMAZING! How insanely yummy do these look??? The devil talked me into making these tomorrow. I could never hate you Geni! In fact, I love you even more with these biscuits!! Now that I’m a “Southern” Spicegirl I must learn to make amazing biscuits! These will certainly help me make some new friends here! I love your pics too! Your whole blog looks so fresh and professional, you must have done something, or is it that I’ve just been gone too long?! Hate the woman that taught me how to make tomato jam? Never! I cannot wait to give these recipes a try, Geni, and I cannot thank you enough. I will check out Marisa’s blog to get the canning instructions, although I’ve got a pretty good idea already. My tasters are going to love this one! Great post! Just looking at your pictures of the biscuits makes me crave them! I love these biscuits. They pair so well with tomato jam. Well done! Hate you ? for sharing beauties like these? quite the opposite, you are my hero because I have a heap of tomatoes and I need to use them up. Your post could not have come at a better time! I’m in love.. I’m so glad you discovered this combination. We’re all the lucky ones.. since you’ve gone to the work of recreating them for us!! All we have to do is make both and enjoy!! You’re on my summer list now!! these biscuits look so fluffy! Couldn’t hate you, you are very entertaining. I love your recipes. Now I have to make this one. 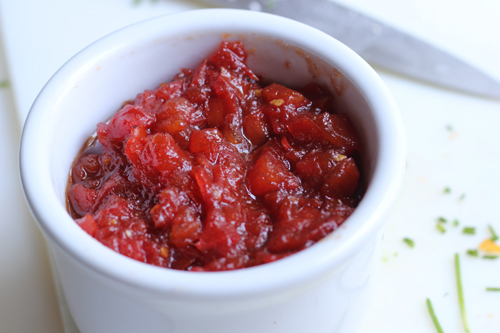 I’ve never had tomato jam, it looks fantastic! Ok – cheddar biscuits may be my favorite thing ever. They’re amazing. And I find it weird that something like tomato jam can be so appealing. It sounds delicious. Wow! How nice of you to stop by and leave a message and especially for the “secret” tips. P.S. I don’t think my biscuits were really as good as Solace’s, but perhaps my dad was just trying to be nice (so I’d make them again sometime). He will be down there this weekend, and will absolutely be eating at Solace and taking some biscuits to-go. And the quinoa with homemade ricotta is next on my list of copycat recipes since I haven’t stopped thinking about that either. Wow! Those both look great! This just sounds so intriguing to me – something completely new in my world… but I completely trust your judgement and may have to give these a try. What a lovely savoury scone recipe. tomato jam- i need it. why have i not had it before. i need it! Send it to me! I’m always up for taking a risk if it involves promises of absolute deliciousness like this. I have a feeling I’d be craving this a lot too. It’s now officially on my list of things to make. And orange infused butter????? Holy he!! is right! YUM! well now I certainly get why, in your email, you said you were obsessed with tomato jam! I shall be making it and becoming obsessed myself, imminently. Oye, this combination sounds incredible. Definitely a love/hate relationship going on right now. 😉 I really need to make those biscuits asap!!! Love the changes you made to your site! And this jam is absolutely to die for! That sounds amazing. I wish my tomatoes in my garden hadn’t been pilfered by many hungry rodents so that I could make this! If I get the bumper crop of tomatoes that I am expecting this is going to be one of the first things I make. So glad your father talked by into changing the reservation. 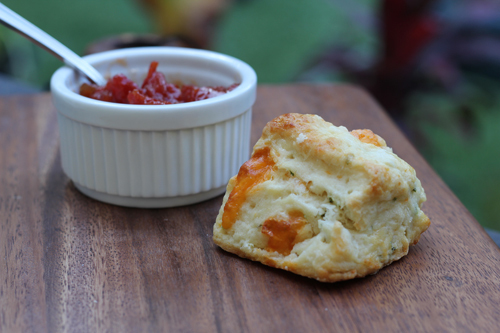 I have a weakness for biscuits and combined with the tomato jam, I may now have an obsession. 🙂 love the recipes! Obsessed with the tomato jam at this local restaurant. Made this last night and wow! This is good and EASY to make. I wanted something that was healthier than store bought ketchup. This is great. I might cut the sugar in half next time. It is a bit sweet but honestly probably goes very well with the cheddar chive biscuits which my restaurant also makes with it’s jam too and is really a good match. Thanks for posting this. Planning to give it out to friends! Thank you. How kind. I’m glad you liked it. You are so right. Made this awhile back. Came back to comment…came out better than the restaurant as I was able to control the way I wanted it to taste more. I’m craving it now lol! Ok, so this reply is only two years too late, but I’m so glad you liked it and even happier that you commented TWICE. 🙂 Cheers. LOL…so sorry, I just noticed I commented before!